The first supernatural Ghost Rider is stunt motorcyclist Johnny Blaze, who, in order to save the life of his mentor, agreed to give his soul to "Satan". Instead, his soul bonded with the entity called Zarathos. When utilizing Zarathos' powers Blaze's flesh is consumed by hellfire, causing his head to become a flaming skull. He rides a fiery motorcycle and wields trademark blasts of hellfire from his skeletal hands. The Ghost Rider is a human who can transform into a being with a flaming skull and supernatural powers. The motorcycles he rides can travel faster than conventional motorcycles and can perform such seemingly impossible feats such as riding up a vertical surface, across the surface of water and leaping across great distances that normal motorcycles could not match. The Ghost Riders are notoriously hard to injure by any conventional means, as bullets and knives usually pass through them without causing pain. 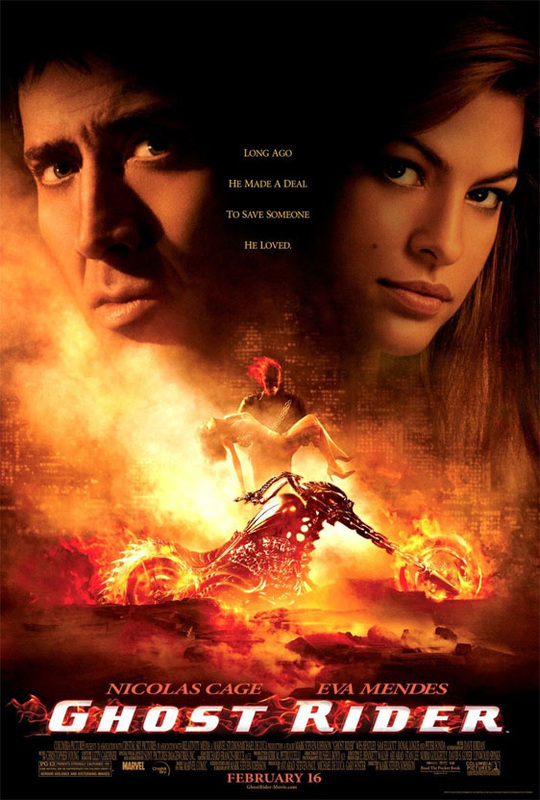 Nicolas Cage as Johnny Blaze / Ghost Rider: A motorcycle stunt man who sold his soul to a demon and became a vengeful fiery spirit that feeds on the evil of his victims. Johnny Whitworth as Ray Carrigan / Blackout: A mercenary, drug dealer, and gun runner turned into Blackout by the Devil to complete his job. Ciarán Hinds as Roarke / Mephistopheles: The mortal form of the demon who transformed Johnny Blaze in the Ghost Rider. He has fathered a child, with Nadya, and has plans for the boy, Danny. Violante Placido as Nadya: Danny's mother and Ray's ex-girlfriend who helps Johnny to stop Mephisto from taking over his body. Fergus Riordan as Danny: A young child caught up in a demonic conspiracy who ends up in the care of Johnny Blaze during his travels. In order to save his dying father, young stunt cyclist Johnny Blaze sells his soul to Mephistopheles and sadly parts from the pure-hearted Roxanne Simpson, the love of his life. Years later, Johnny's path crosses again with Roxanne, now a gogetting reporter, and also with Mephistopheles, who offers to release Johnny's soul if Johnny becomes the fabled, fiery Ghost Rider, a supernatural agent of vengeance and justice. 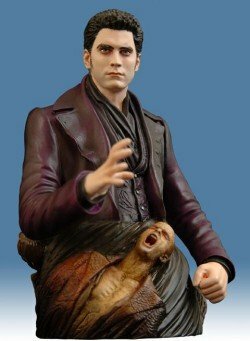 Mephistopheles charges Johnny with defeating the despicable Blackheart, Mephistopheles's nemesis and son, who plans to displace his father and create a new hell even more terrible than the old one. 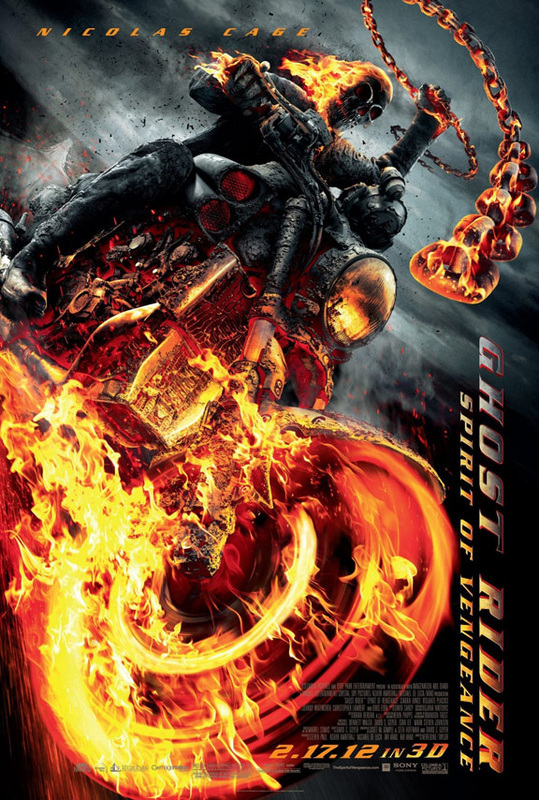 Nicolas Cage as Johnny Blaze / Ghost Rider: A motorcycle stuntman, who makes a deal with the Devil, so that he can save his sick father and in the nights he transforms into a supernatrual demonic soul hunter known as the Rider. Eva Mendes as Roxanne Simpson: A reporter, and Johnny's girlfriend. Wes Bentley as Blackheart / Legion: the evil manipulative and powerful Son of Mephisto who wants to use the Contract in order to unleash hell over Earth. Sam Elliott as Carter Slade / Caretaker: The first Ghost Rider, and an ally to Blaze. Ghost Rider Movies Prop Peplicas, Figures, Toys and Collectibles! From the Ghost Rider movie comes this Ghost Rider Johnny Blaze Bust that is truly a sight to see! 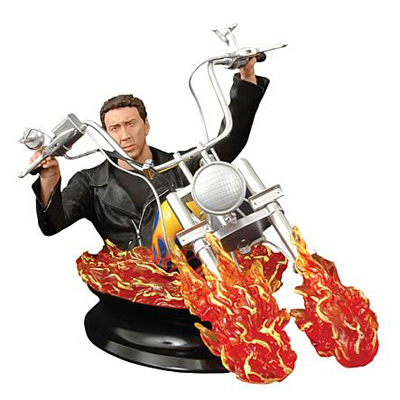 Featuring the digitally-scanned likeness of Nicholas Cage, this 6-inch tall bust also includes his trusty stunt bike and clear flame accents. Sculpted by Gentle Giant and limited to 3,000 pieces, each bust features a hand-numbered base with matching box and certificate of authenticity. From the Manufacturer: Sideshow Collectibles is proud to bring you the latest addition to Hot Toys' Movie Masterpiece Series, the 1/6th scale Ghost Rider Limited Edition Figure with Hellcycle from the Ghost Rider movie. 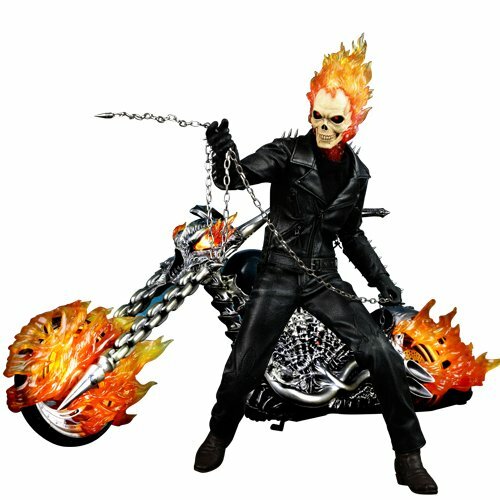 The highly detailed Ghost Rider collectible is specially crafted based on the image of Nicolas Cage in the movie, highlighting the newly sculpted head and skull, light-up functions on skull and detailed weapons. The set also comes with a motorcycle with light-up functions in front blinkers and wheels. The Prince of Lies himself can now be added to your collection with this Ghost Rider Mephistopheles bust! 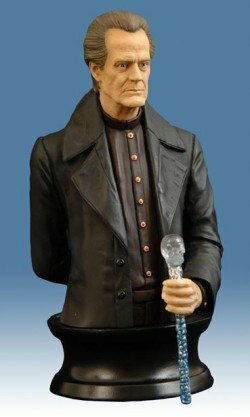 Created using a digital scan of Peter Fonda, this 6¿ bust showcases the master of evil¿s wicked ways as well as his demonic cane seen in the film! Sculpted by Gentle Giant and limited to 3,000 pieces, this bust features a hand-numbered base with matching box and Certificate of Authenticity. The unstoppable Blackheart faced off against Ghost Rider 2007's feature film, and here is your chance to add this classic villain to your collection! Sculpted by Gentle Giant using the latest in digital scanning technology and limited to 3,000 pieces, each bust features a hand-numbered base with matching box and Certificate of Authenticity.